Over in our All Things Cake Facebook Group (come join if you haven’t already!! 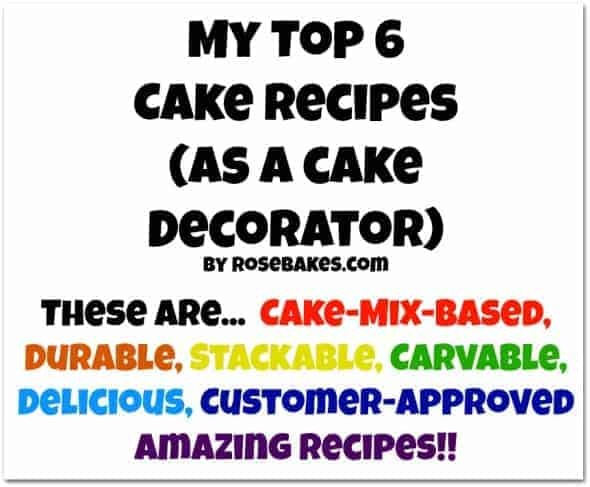 ), someone asked for some basic starter recipes and that’s when I had the idea to share my Top 6 Favorite Cake Recipes. The girl asking was actually looking for scratch recipes (which we all know, I rarely do), but I thought that would be a good subject for a blog post… to round up all of my favorite recipe links in one spot! 1. Vanilla Cake – this is my single most popular flavor. I use it for almost all birthday cakes and baby/bridal shower cakes plus quite a few wedding cakes. It’s delicious, moist, sturdy enough for fondant decorations and stacking for tiered cakes, freezes well, etc. I could go on and on… it’s my #1 go-to recipe. 2. White Almond Sour Cream Cake (aka Wedding Cake) – this flavor is also incredibly popular with my customers. Not only do I use it for weddings, but I also use it for birthdays and showers and I can easily sell a few dozen cupcakes a week in this flavor if I have them leftover/extra. 3. (Dark) Chocolate Cake – when I make a chocolate cake… it’s this one! My friend Shelly shared this recipe with me a few years ago and it’s so, so good. This is one of the only recipes where I choose Duncan Hines over Pillsbury as my starting cake mix … and I use the Dark Chocolate Fudge but nobody has ever complained about it being too dark! 4. Red Velvet Cake – I’m not a big fan of eating red velvet cake, but when I make it for customers, they love this recipe! It’s an adaptation from a recipe my Aunt Carol gave me (to make it sturdier and not so soft) and it’s always a big hit! 6. Strawberry Cake – like the red velvet cake, Strawberry cake is not my favorite (personally). But my husband and sister and both of my sisters-in-law absolutely go nuts for it and swear by this recipe! It’s also really popular with customers… just this weekend I’ll be doing an entire 5 tiered wedding cake in this flavor! For my local cake business, almost all of my cake orders are for those flavors. I’ve used them all for tiered cakes and wedding cakes as well as carving and cupcakes. They’re very versatile, reliable recipes!! Click on the pic above or sign up for the FREE Pillsbury newsletter here and you’ll get exclusive coupons (up to $250 per year in savings), access to free samples, the hottest recipes and more! I use Pillsbury in almost all of my cake mix recipes, so I love an opportunity to get free samples and coupons! Butter Cake – this is my Daddy’s favorite cake and for butter-cake-lovers… this one is terrific! I don’t get requests for it often but it’s fantastic! Loaded Carrot Cake – this is a scratch recipe and it is OUT OF THIS WORLD. I make this a lot around the holidays!! One Bowl Chocolate Cake… good, good, good (but not so good for fondant/tiered cakes because it’s melt-in-your-mouth soft – or at least that’s been my experience… I understand other decorators do use it for stacking). Caramel Cake – this is also a popular cake that seems to be seasonal around where I live! And that’s it for now…my most requested and favorite cake recipes!! What is your most popular flavor? Can’t wait to try your recipes Thanks for sharing. Awesome – I hope you love them! I will start off saying that I was so excited to find your cake recipes. They were just what I needed for my nieces wedding. Chocolate, strawberry, red velvet, white and then for the lemon cake I used the durable vanilla recipe and substituted lemon cake mix for vanilla. The cakes were super moist and had a great flavor. I made chocolate and lemon into a 16″. Red velvet and strawberry into an 12″ and the white into a 8″. Two days prior to the wedding we had to remake the lemon because when we took it from the freezer and went to tort and crumb coat it fell apart. We had everything ready the night before the wedding and then the morning of the wedding the 2 -12″ cakes started separating and literally falling apart they also were too moist. So we had to remake them. The chocolate cake was the very bottom cake. After transporting the cakes for 1 1/2 hours when we reached out destination the bottom cake was basically falling apart, again due to moistness. We had to take off the bottom layer and through it away now the cake was totally out of perportion. Luckily we tried to fix it with borders and try to expand the decorations to cover mistakes. I am thankful that we had enough cake and that was only because not everyone showed up as they had planned. The only cake mix I will ever use for wedding cakes is your white(aka wedding cake) recipe and then change out the cake mixes to accomadate for different favors. This was the biggest cake we had ever made and it turned out to be a day to forget. I followed the recipes just as you had them, I have no idea what went wrong, but I do not recommend any of your recipes for wedding cakes except the white one, none of the others held up. Needless to say it cost us money, time, and a lot of stress on my sister and us as well. I’m truly sorry to hear this Sheila, but I use these recipes all the time for weddings. I just used the white cake recipe yesterday for a 3 tiered cake (which I delivered 45 miles away) and I use them all regularly – they’re my ONLY recipes. I’ve made them as big as 6 tiers and transported them completely assembled with no problems. If you go to my gallery and look at all the wedding cakes I’ve done – they’re ALL these cake mix recipes and 90% of them are delivered 45-60 minutes away. The only one I ever had break apart was a 16″ tier and it was a 3 hour drive to the location. About 2.5 hours into the trip, it cracked. I think that length of a drive and that much jostling around is simply too much for any cake, so I no longer take orders that far away. Maybe you can help me out on what went wrong. I baked the cakes Two weeks prior to the wedding. Took them from the oven let them sit out 15 minutes put a simple syrup on them wrapped twice with plastic wrap and then wrapped them in foil. Took them from the freezer let them thaw torted and then crumb coated. Put them back into the fridge to crust up before frosting. Can you advise me on what I did wrong on any of those steps so far. My first guess would be the simple syrup. I never add simple syrup to these cakes. Never. That extra liquid may be what pushed them over the edge of being too moist. I haven’t frozen cakes in years – so I’m not sure if that would change anything, but I don’t think that would affect them. I also don’t torte my cakes. The simple syrup may have done it. Would the torting add a lot of moisture to the cake? Thank you for your help Rose. No, torting itself wouldn’t add any moisture, but it would possibly make the cake more unstable. It also depends on what you’re filling the cake with between the layers. If you’re using a thin filling that wouldn’t cause the layers to firmly stick to one another, then it might make them more likely to shift/crack. Thank you so much for all your information. I will know what to do to make everything right the next time. Have a great evening. Freezing WILL change the cake! A lot of people freeze the layers so they will be more “moist”. Personally, I don’t like to do this because (to me) it makes them soggy and fragile…and I like to do everything “fresh”. I would say shlepping the cakes with simple syrup, then freezing them is what made them unstable. I’m sure this ladies issues had nothing to do with your recipes as written and directed. I have frozen a cake before, but never for 2 weeks. Personally I wouldn’t want a cake that sat in the freezer for that long as it can change the flavor. I do like to freeze them overnight to make them easier to crub coat. In most cases they are thawed by the time I’m ready to decorate. I also choose not to use any boxed cake mixes. I feel I can always tell when a box mix is used because the flavor is distinct even when doctored. They also tend to be a lot more moist and apt to crack. From scratch takes a little more time, but the homemade flavor is totally worth it! Just wondering what you thought and if you think it makes any difference. Hi Cindy! I’ve heard of using milk vs. water, but I’ve honestly never tried it. My customers have always loved my cakes as they are so I haven’t experimented a lot with changing them up. Sorry I’m not much help on that! Hi! I’ll be making my daughters birthday cake..I want to make a rainbow cake and will be using box mixes but will just add the colours. Where I live I will not find the vanilla pudding mix. Is their an alternative? I’ll be using 10 inch pans. Do you know how many Pillsbury packets I’ll need to make a 4 layers cake, cake 10 inches each layer and how much buttercream? Hi Hiba – I don’t know of a substitute for pudding. You might want to try this cake recipe instead: white almond sour cream. It doesn’t require pudding. You’ll probably need 1 box per 10″ pan. As for buttercream, I think one of these big batches should be enough. Not that I am the grammar police or anything but there is a slight slip in your article … “sue Pillsbury” instead of “use Pillsbury” … I had a little chuckle :). For your vanilla and chocolate cake recipes is there any way I could replace the sour cream for someone who is lactose intolerant? Is there any way to replace the sour cream in your vanilla and chocolate cake recipes? I have someone who is lactose intolerant that I need to make a cake for. Not that I know of Alycia. The only substitution I’ve ever made is plain yogurt for sour cream, but that doesn’t help with the lactose issue. Could you recommend a white cake to bake in a 9x15x2 pan?? Thank you. You can bake my white almond sour cream cake in a 9×13! Hi Meagan – Honestly, it rarely comes up in conversation. I list the flavors I make without going into details. Even if I baked from scratch, I can’t imagine a time when I’d be talking about flour, sugar, butter, etc. Most people who order my cakes are ordering because they’ve had it somewhere else and loved the way it tasted so they don’t care how I make it. If someone does ask, I tell them I use a cake mix as a base and doctor is up from there. In 5 years of running a business, I think I’ve only lost one order because of that. I have a post about how I do tastings here: https://rosebakes.com/how-can-home-bakers-do-wedding-cake-tastings/. Let me know if you have other questions! Thanks for responding, your points are greatly appreciated. I don’t know exactly how to word what I’m trying to ask and maybe it’s so simple that that everyone already knows and I’m just missing the mark completely, but how do you make exactly the amount you need from starting with a box mix that has a set amount of ounces. Say you just need to make a 4″ cake…do you some how portion out the mix to only use x amount and leave the rest? Or just bake it all and have left over batter/cake? I never portion it out that way. I always have extra that I either make into cupcakes to sell or I freeze the batter for next time. The chocolate cake seems to fall easier than the vanilla for some reason. It just needs to be cooked a little longer or you could use a heating core to prevent that! I talk about those here. I’ve been using your cake recipes for the last year and absolutely LOVE them!! I’ve recently been asked to bake a gluten free cake. Do you have any recipes for a gluten free cake or suggestions? Thanks again for sharing your recipes. They are fantastic! Hi Tammy, I’ve baked gluten free 2 or 3 times for one of my clients who has a son with a disability. But honestly, I’m not confident enough in the results to recommend any particular recipe. I’m sorry! I recently made your One Bowl Chocolate Cake, and it was SOOO good. My husband didn’t even care if it was frosted because it is so moist. Thank you for sharing your recipes. That’s so awesome to hear – thank you for commenting! You’d need to double the recipe to have enough batter for (2) 8″ pans and you’ll have some leftover. I can tell you the recipe makes a little more than 5 cups of batter (I’ve never measured it exactly) and I use this chart to determine how much for each pan: https://rosebakes.com/wilton-cake-chart/. I love your website and use a lot of your recipes when baking. You are my go to website! I have a request for peanut butter cupcakes with peanut butter frosting. I have never made these before and have been searching for a good yet easy recipe but am coming up empty handed. I can’t seem to find a recipe on your your website for these either. I was thinking about just using the butter recipe and adding to it. Do you have any thoughts on how much peanut butter to add to it? Do you think that will work or do you have any other suggestions. Thanks in advance for your help! Ok, great! I can’t wait to see it. Thank you! Thank you so much, Rose! It sounds wonderful and I can’t wait to try it. Here’s the peanut butter frosting recipe: https://rosebakes.com/creamy-peanut-butter-frosting. Love your cakes!! Do you charge the normal cake price for naked or near naked wedding cakes? I have a minimum $4 per serving no matter the deesign. And most naked cakes do stay close to that minimum per serving charge. I have this post pinned & have come back to it several times just for these recipes. However when I have been at your site for other reasons & inspiration, I’ve notice 2 other white cake recipes. Now I’m confused! 🙂 I’ve found the White Sour Cream Cake, Super Moist Durable Vanilla Cake & the White Almond Sour Cream Cake recipes. I’ve tried to compare them on paper & can see some differences but wonder what the major differences are & how you would choose which one to use for which projects and why? If you had a customer that just said they wanted “vanilla” cake and it required some carving which would you choose? Also, if someone asked for whatever one “tastes best” which would you choose? Vanilla Cake and White Almond Sour Cream are 2 different recipes. The White Sour Cream cake is slight variation of the White Almond Sour Cream (just no almond – and I may have tweeked a couple of other things), but basically the same except for the flavoring. thank you for your recipes. Your chocolate cake is amazing. I do have a question- I have made your chocolate cake 2 Times now and both times when I take the cakes out of the oven they start falling. They are done (per the toooth pick test) I used Bakers Joy to prepare the 2- 9 in pans, I mixed for 3 minutes using my hand mixer ( I didn’t use my kitchen aid the second time to make sure I wasn’t over mixing) I used different pans this time….any thoughts? This recipe is amazing so I don’t want to find something else- I would just like the layers to be 2 inches instead if 1. Are you using the doctored chocolate cake mix recipe or the scratch cake? Doctored cake. It shrinks in diameter too. Do you live at 3,000 feet altitude or above? Hi Rose, do you have a lemon cake recipe? #2 /wasc recipe does not connect anymore! Thanks Sandra – I’ll get that fixed right away! Thanks for sharing it with us. Very interesting tips and it will definitely help me in my business. I working from home aswell and therefore need some better ideas to do better each day.